Unfortunately, the moon was too pale to be visible in this photo. 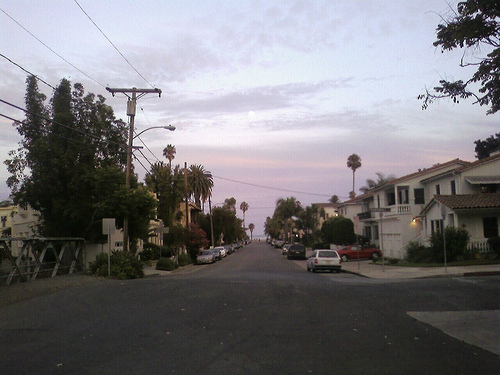 This is Santa Barbara — looking down Chapala Street toward the ocean from the corner of Chapala and West Yanolani. It’s very pretty there, but where we were there is not enough surf, just harbor. I prefer waves. Many many terrifying waves. Joe Crawford blogged this at 10:45am in 2007 in August. The 28th was a Tuesday. You are reading this 12 years later. Comment. There are no comments Tweet. Send email. It has hashtags→ photos .